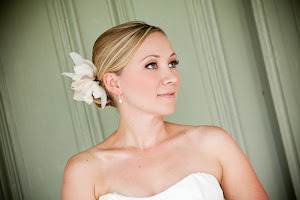 Le Mariee' : Should You Use Airbrush Makeup On Your Wedding Day? Should You Use Airbrush Makeup On Your Wedding Day? There seems to be a lot of talk about airbrush make up and if you browse through any brides forum it's a subject that is cropping up more and more. So, what is airbrush make up and what's so special about it? Why should YOU seriously consider it for your wedding day? Well, it's a make up technique that's actually been around for about 10 years but has been principally used in the film and television industry. It really is sprayed onto your face ( or your entire body, if that's what you want) and gives a perfect finish. It can cover pretty much anything, from tattoos, port wine stains, spider veins, acne scars, freckles and fine lines. In fact, it's the only make up that can stand up to the intense and cruel spotlight of High Definition Television and that's why the industry uses it. •Book a trial session with the artist (preferably one that specialises in the technique) a few weeks prior to your wedding day and see how you like it and how good they are. •The make up should not be a thick layer that clogs up your face - if this is the result you get at your practice session, then don't use that artist again because they simply do not know what they are doing. •Some make up artists may use alcohol in their spray mixture - while this provides increased resistance to sweat, it's not always suitable for sensitive skins. Discuss this with the artist. •To avoid a disaster, your best bet is to go with a professional Bridal/Wedding Makeup Artist or hire someone who comes highly recommended. While it can be used to apply blush, and even eye colour, many artists prefer to use it to achieve a smooth foundation and then go on to apply the rest of your make up with brushes. The good old-fashioned method, if you like. It's not a cheap process and prices vary quite a lot, from about $180 to $300 for a session. Is it worth it? Well yes, definitely, if perfection is what you're after.